Alternative rock band from Great Yarmouth, England, not to be confused with the American indie rock band Catherine. Catherine Wheel's band leader, Rob Dickinson, is a cousin of Iron Maiden's Bruce Dickinson. Apart from a family connection they apparently also share a fascination for all things horrible, because both Iron Maiden and Catherine Wheel are torture tools. Simply put, a Catherine Wheel is the tool that an executioner used to break someone, in every sense. The unfortunate ones who ended up on the wheel were beaten with sticks, rods, axes and swords. In the end the various detached body parts were artfully woven through the spokes of the wheel, after which it was left to birds of prey to finish the job. 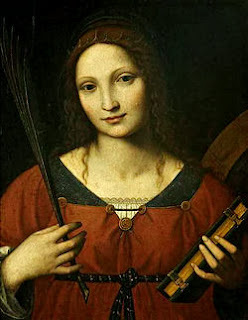 The reason that the charming name Catherine was connected wth this gruesome procedure is, that Saint Catherine of Alexandria (282-305 A.D.) came to her end on such a dead man's wheel.